Speed is the rush when the throttle is open and the bike’s just about to take flight. Speed is a fugitive, always a bit faster than the ride and rider in pursuit. Nothing but speed will take the record for a flat-out mile on the Bonneville Salt Flats, and that record is what the team is after. Anything less than the record just isn’t fast enough. Speed is the rush when the throttle is open and the bike’s just about to take flight. Speed is a fugitive, always a bit faster than the ride and rider in pursuit. Nothing but speed will take the record for a flat-out mile on the Bonneville Salt Flats, and that record is what Larry Petrie is after. Anything less than the record just isn’t fast enough.Land speed recordActually, it takes two flat-out miles to get the record. Any difference between the fastest speed recorded for each run is the rider’s official score. Last year Petrie set the record in his class with 148.307 mph, the difference between 146.600 and 150.014. This year he plans to break it.Land speed records are the big leagues, and the main event for this kind of racing is the BUB International Motorcycle Speed Trials held over five days in September on the Bonneville Salt Flats in Utah. This is where Petrie set his record last year for the Modified Pushrod Gas 1650 cubic centimeter class.Except for modified steering and foot-peg mounts, his bike looks like it could be just another street bike of the particularly muscular sort, at least to those who don’t know anything about motorcycles. When Petrie and his partner Bob Tronolone get to talking about the machine, though, just about any resemblance it has to the domestic motorcycle vanishes.This bike is a wild thing, a purely exotic species whose every ventricle, port and shaft has been shaved, shaped and scaled to within thousandths of an inch of breaking so that when it runs, it’ll push right onto the razor-sharp edge of its own self-destruction. Fly or die trying is all this bike does. “There ain’t no mercy on the far side of the speed limit,” is how Petrie and Tronolone see it. 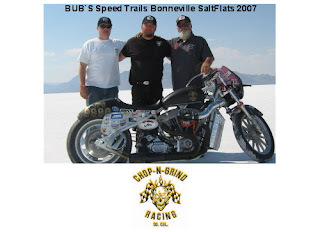 Team Chop N GrindPetrie got the bug for land-speed record chasing when a former instructor of his from Motorcycle Mechanics Institute in Phoenix where he went to school took him along to Bonneville one year as a crew member. That bike didn’t even get out of the pits, but Petrie liked what he saw. Here was where the roar and risk of speed had all the freedom it could want, and to make it even better, it took a mechanical finesse of the surgical sort to make those machines go so fast.Laughing about it now, Petrie says he came home and in two months threw together a turbo-charged bike that had more turbo-chug than charge when he entered his first event. Nevertheless, he was hooked and continued working with that machine until Tronolone came along.Tronolone had history with land speed motorcycle racing that went back to the 1970s. He knew what it took to succeed in the Bonneville big leagues, and between his experience and Petrie’s mechanics, and Petrie’s passion for riding on the edge, they actually thought they might stand a chance at record-setting together. They added two more members to the team, Danny McPherson and Rob Tronolone Jr., and Chop N Grind Racing was born. That was four years ago, and since then, this grass-roots team of home-town mechanics has proven that even in the world of big-money, professional racing, a record-breaking motorcycle can still be built at home in the garage by speed-wise motorheads with day jobs. They proved it last year in September, and they plan to prove it again this year.Hands-on techBig-time motor events are big-time money enterprises, and even though a dark horse team like Chop N Grind can come out of nowhere with a serious vehicle paid for on the budget plan, it still isn’t exactly a thrift-hobby.Chop N Grind’s bike uses a stock, after-market frame, but every angle on it has been reconfigured to increase stability at high speeds. The motor is a hybrid affair, built by Petrie and Tronolone from the parts of two Harley Davidson engines of different vintages. It’s safe to say that every part on the bike has been refined in one way or another, and by the team’s estimate, the whole thing took about $25,000 to build.Of course, this is only for starters. By Tronolone’s account, it costs about $20,000 a year for the team to make new refinements to the bike, replace any marginal parts, and pay for all the registration and operations costs to compete in the five day BUB Trials. Even the gas to run this bike is specialized, and expensive, although it may not be more expensive than the nitrogen used in the tires to prevent their expansion at high speeds, which can lead to a possible blow-out or tire delamination.In many ways, the bike is just about as design-tech as any other vehicle in the BUB Trials. Unlike most of those bikes, though, all the work on this one is hands-on and homemade.Only a few machining procedures require a true specialist’s touch, and fortunately for Chop N Grind, one of motorcycle racing’s premiere specialists lives right here in the neighborhood. Jim Leineweber grinds cams for high performance junkies all over the nation, and the Chop N Grind boys only have to make a short trip to Landers for his services. Hutchins Motor Sports is another important resource that’s local. Over the years, Petrie and company have relied on the place for everything from parts to specifications for aerodynamic modifications.Making it countAlthough the Chop N Grind team’s story may have a little something of the underdog-makes-good subtext to it, the team does have the bike to beat this year. It is the team with the national record, and if it doesn’t have as much money as most other teams, it has the speed. That’s all that counts.Tronolone has described his partners in a publicity piece as “real deal racers.” At least part of what he means by that was elucidated by him and Petrie in an interview when they talked about the team and its obsession.“We all came from street racing and have a thing for speed,” said Petrie, but he qualified his comment to stress that, “the best speed of all is the speed you’ve built yourself.”For Petrie and his team, the obsession is as much about designing, blueprinting and building the vehicle as it is about actually seeing the thing in operation. Naturally, the object of the BUB event is to turn the fastest time in a category of other contestants, and owning the record is important. However, from both Petrie’s and Tronolone’s comments, the motive force behind the “real deal racer’s” obsession is to just build something that will go as fast as it can, and when that’s done, you do it all over again to make it go even faster.Whereas the street once seemed like a place to go fast, it was just never pure enough, said Petrie. “Too many distractions. Too many unknowns.”When he lies down on the bike and turns it loose, he doesn’t want to pay attention to another rider next to him, or watch to see if something’s in the road ahead or someone’s pulling out of a driveway. The real place for speed, Petrie insists, is someplace where there are no external limits, where “it’s just the rider, the bike, and time.”This year the team intends to break its record with two runs over 150 mph. What they get if they do is a second citation in the record book, a certificate and, as Tronolone puts it, “bragging rights.” Then they have a year to tear the bike apart and put it all together again to see if they can’t make this year’s record yesterday’s news. The only speed that really matters to them is the one they haven’t hit yet.